This article is provided for general information only. Not all procedures apply to all makes and models. The term Parasitic Load refers to electrical devices that continue to use or draw current after the ignition switch is turned to OFF position. This small amount of continuous battery draw is expressed in milliamps (mA). On Ford Motor Co. and General Motors vehicles produced after 1980, a typical Parasitic Load should be no more than 50 milliamps (0.050 amps). Vehicles produced since 1980 have memory devices that draw current with ignition off for as long as 20 minutes before shutting down the Parasitic Drain. When Parasitic Load exceeds normal specifications, the vehicle may exhibit dead battery and no-start condition. completion. A brief overview of a suggested test procedure is included along with some typical Parasitic Load specifications. Refer to the GENERAL MOTORS PARASITIC LOAD TABLE chart. CAUTION: Always turn ignition off when connecting or disconnecting battery cables, battery chargers or jumper cables. DO NOT turn test switch to OFF position (which causes current to run through ammeter or vehicle electrical system). NOTE: Memory functions of various accessories must be reset after the battery is reconnected. The battery circuit must be opened to connect test switch (shunt) and ammeter into the circuit. When a battery cable is removed, timer circuits within the vehicle computer are interrupted and immediately begin to discharge. If in doubt about the condition of the ammeter fuse, test it with an ohmmeter prior to beginning test. An open fuse will show the same reading (00.00) as no parasitic drain. Begin test sequence with the meter installed and on the 10-amp scale. Select lower scale to read parasitic draw. Turn ignition off. Remove negative battery terminal cable. terminals. See Fig. 1. Select 10-amp scale. must be off before turning test switch knob to OFF position. to ON position and reverse leads. Turn test switch to OFF position. switch to ON position to keep electrical circuits powered-up. battery cable to the negative battery terminal. Fig. 1: Connecting Kent-Moore Disconnect Tool (J-38758) Courtesy of General Motors Corp.
Electronic Level Control ... . Heated Windshield Module . . . . Retained Accessory Power .. . . Twilight Sentinel Module .. . . Intermittent parasitic lad can occur because of a memory device that does not power down with ignition off. With an intermittent parasitic load, battery draw can be greater than 1.0 amp. To find and intermittent problem requires that an ammeter and Disconnect Tool (J-38758) test switch be connected and left in the circuit. See Fig. 1. Road test vehicle. After road test, turn ignition off and remove key. Monitor the milliamps scale for 15-20 minutes after ignition is turned off. This allows monitoring memory devices to determine if they time out and stop drawing memory current. The test switch is needed to protect ammeter when the vehicles is started. Step 1) Select the X1 SCALE and zero the needle. 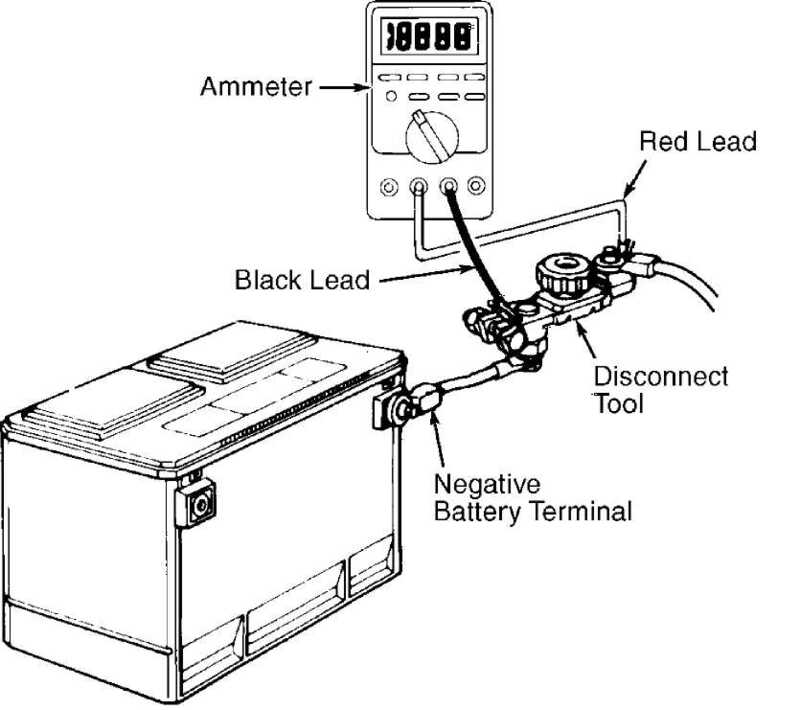 Step 2) Attach the POSITIVE SOLENOID LEAD (Red lead) to the POSITIVE METER LEAD and the NEGATIVE SOLENOID LEAD (Black lead) to the NEGATIVE METER LEAD. Step 3) Reverse the solenoid lead attachments. Fig. 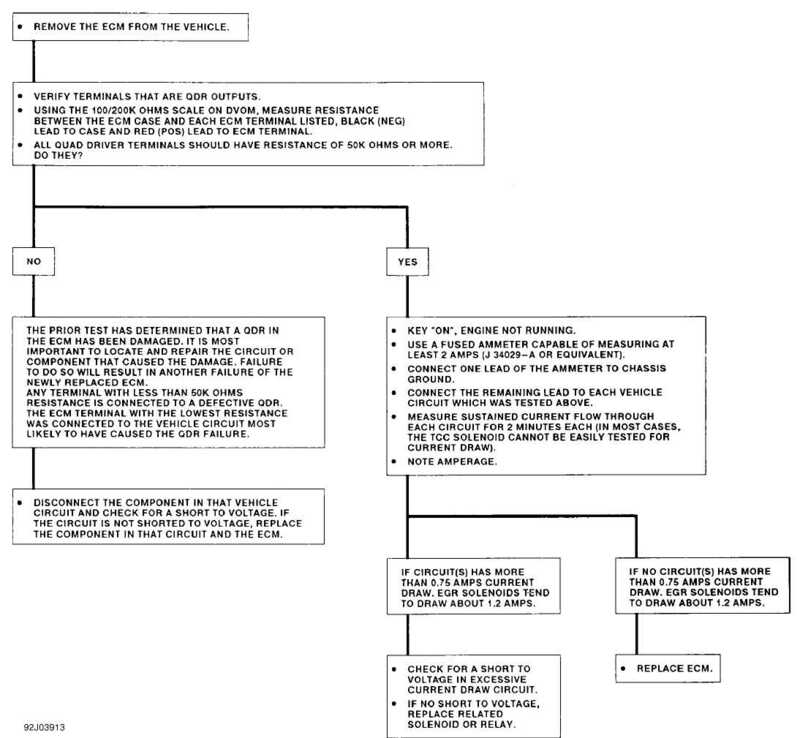 2: Diode Check & Solenoid Test (General Motors) Courtesy of General Motors Corp. Fig. 3: Quad Driver Test (General Motors) Courtesy of General Motors Corp.